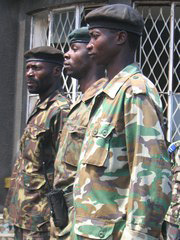 KINSHASA, 7 Jul 2006 (IRIN) - The disarmament and demobilisation programme of the Congolese army has been suspended due to lack of funds, according to François Atufuka Mbuze, spokesman for the National Demobilisation and Reintegration Commission (CONADER). Atufuka said CONADER had closed 18 orientation centres across the country on 30 June. "From this moment onwards, all the orientation centres have been closed and we are setting up mobile intervention teams to intervene when needed," he said. "We do not have the funding to proceed with the programme." Atufuka added that 65 percent of the army's troops, or at least 60,000 soldiers, had passed through the centres, and some 40 percent had chosen to remain in the army. The disarmament and demobilisation programme has been beset by problems since the start. Ideally, the former soldiers are expected to spend one week at the disarmament centres, but logistical problems mean they sometimes spend more than 15 days awaiting their severance pay as they are prepared for reintegration into civilian life. Non-payment has led to frequent outbreaks of violence at the centres, and delays in the process have prompted demonstrations in protest at the slow pace of reintegration. For the army and those soldiers who choose to remain in the military, the delays have also proved frustrating. "The work of the orientation centres throughout the country was delaying the integration process, because some of these centres were empty for several months waiting for the demobilised - it was difficult to know who would like to leave the army or stay," said Col Aime Mbiato, the officer in charge of the army's integration programme. The closure of the orientation centres came as the army announced it had integrated 12 brigades, whose members formerly served with various belligerent factions during the civil war. "We are about to begin training six other brigades," Mbiato said. Some of these newly integrated brigades have been deployed in the northeastern district of Ituri, Orientale province. In June, some troops were attacked by militiamen who retook control of their stronghold, the town of Tcheyi, 80km south of Bunia, the main town in the district, according to Lt-Col Stephan Lescoffit, a military spokesman for the UN Mission in the DRC, MONUC. MONUC said the attack on Tcheyi came as 2,613 militiamen surrendered their weapons in Ituri, among them the political commissar of one of the armed groups, 'Colonel' Emil Muhito Akobi. This brought to 16,500 the number of militiamen and women who have been demobilised in the district. In addition, 1,761 guns and large quantities of ammunition and communication equipment were recovered. [ALERT: IRIN DRC Special - News, views and facts behind the country's forthcoming general election. The 30 July marks the first time in 45 years that the Democratic Republic of the Congo will hold general elections. IRIN has created a special page offering an insight into this historic event. Our reports and background stories will help you better understand life in one of Africa's largest countries - a nation suffering poverty amid natural riches, haunted by conflicts but full of life and hope.